Priyanka Chopra Drops First Look of Met Gala Committee 2019 And Fans Can’t Stop Gushing Over High-Wattage Picture! Priyanka Chopra Features in This Years Met Gala Committee With Hubby Nick Jonas And Global Media Can't Keep Calm Over The OTT High Profile Group! The list of stars, designers, philanthropists and a few athletes, comprising to make the starry list of Met Gala 2019, has been dropped and sharing the news on her Instagram handle, Bollywood-turned-Hollywood diva, Priyanka Chopra, adds another feather to her cap of pride. Featuring in the committee for the May 6 event, Priyanka will be a part of the prestigious group along with not just Hollywood popstar-husband Nick Jonas but also Bradley Cooper, Blake Lively, Ryan Reynolds, Chadwick Boseman, Lupita Nyong’o, Jennifer Lopez and her fiance Alex Rodriguez. Spilling the uncontained excitement of the same on her Instagram handle, Priyanka dropped a picture featuring the members of this year’s committee. 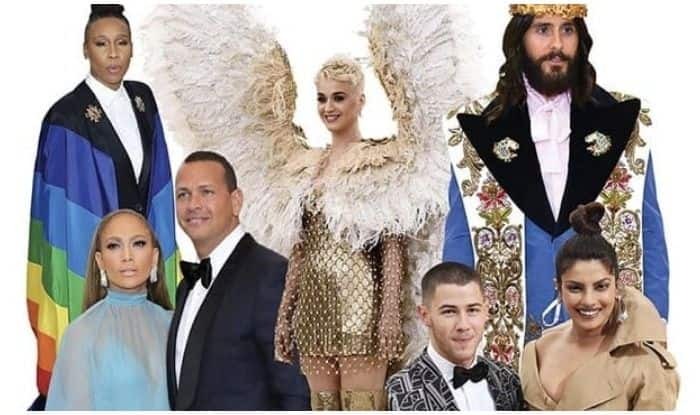 The picture includes Lena Waithe, Katy Perry, Jared Leto, Nick with PeeCee, Jennifer Lopez and Alex Rodriguez. The list has reportedly been approved by Vogue editor Anna Wintour, who can be seen in the inset of the shared picture. Anna will be presiding over the list. With less than a month to the fundraiser night, Priyanka revealed in the caption, “From walking the prestigious carpet for the first time, to meeting my husband and many friends for life… Nick and I are honored to be on the Benefit Committee for this year’s Met Gala. Looking forward to the first Monday in May” (sic). Split among some OTT high profile names from various streams, the list totals 183 people reportedly and will be co-chaired by Anna, Serena Williams, Lady Gaga, Harry Styles and Gucci’s Alessandro Michele who is also the exhibit sponsor. Talking about the event being close to Priyanka and Nick, the duo first made a public appearance at the Met Gala 2017, where Priyanka’s Ralph Trench Coat dress with a train took away all the attention. However, they kept the social media abuzz ever since, with mushy comments on each other’s pictures on the photo-sharing app and being spotted at dinners later, fuelling the rumours of them dating. The two tied the knot last year in December, at Jodhpur’s Umaid Bhawan Palace. Post that they hosted several receptions for their friends and family. Priyanka recently featured along with her husband Nick, in-laws Joe Jonas, Kevin Jonas, Sophie Turner and Danielle Jonas, in Jonas Brothers’ comeback single ‘Sucker’.